BIG TROUBLE IN LITTLE CHINA, 1986. Original 1 Sheet (27 x 41” / 69 x 104 cm) folded Movie Poster starring Kurt Russell, Kim Cattrall, and Dennis Dun. Directed by John Carpenter, and produced by Larry J. Franco. 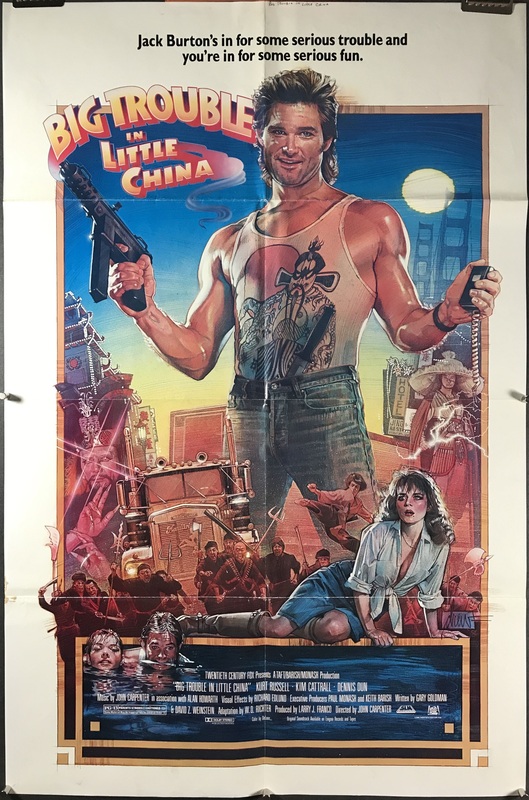 “Jack Burton’s in for some serious trouble and you’re in for some serious fun.” When the All-American trucker Jack Burton arrives in Chinatown, San Francisco to meet his new fiance at the airport from China – she is kidnapped by a Chinese street gang. Burton and his friend Wang Chi embark on an adventure in the underground of Chinatown filled with magic, magicians, monsters and martial arts fighters! This folded 1 sheet poster is in very good original C8 condition. There is a small stain near the bottom of the left-hand side of the poster. There is some color loss along the fold lines, which could be taken care of during the linen backing process. Linen Backing is available for an additional $80 upon request or by adding the service to your cart below. This would produce a flat, backed poster that’s ready to display! We linen back and frame all of our posters IN HOUSE at our studio in Katy, TX!